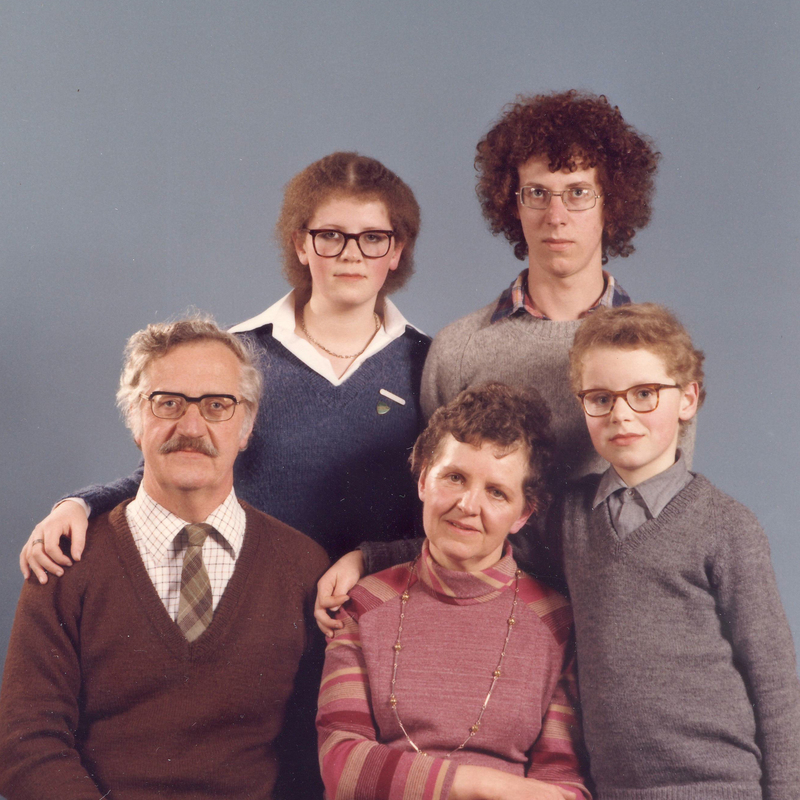 Photographs of families are never straightforward, particularly when it’s your own family. When I tried to recall this photograph I got it all wrong – I remembered it in an oval frame with my father standing at the back and my little brother in the middle. I guess that’s how I remember my father – a strict man, the head of the household. But this was different from our usual holiday snapshots; this was a formal portrait of the five of us, professionally shot in a studio with lights against a grey backdrop. My mum remembers the photograph as being her idea, gathering everyone after school and bringing us to the photographer’s studio in the seaside town where we grew up. She sits in the middle, smiling clear and direct, unlike the rest of us – glassy eyed behind our lenses. It must have been sometime in the mid 1970’s, my sister’s school badge might pin it down, but I do remember that I didn’t want to be there, a teenage resentment at the formality of the occasion, at being portrayed as part of the family unit. My sister and brother both have an arm around a parent, while I remain distant, on the edge of the group, keen to leave home. The original photograph has been on display in its 9x9cm wooden frame in my parents’ front room since it was taken – until now. Visiting my mum this weekend I found it had gone, relegated to a shelf in the sideboard alongside albums and envelopes of family snapshots. Hi Martin, I’d place that photo around 1975-6 I clearly remember you all looking like that. Shame we can’t see your shoes you had some amazing shoes in 1975 (I’ll spare you the embarrassment of describing them here). I like the reconstruction photo too. Good to see you all together. I have a friend who has taken a self portrait once a month since she was a teenager, it’s an amazing collection. Despite your original reluctance to take part you obviously feel a real connection with this photo’s time and place. You recreated it and were quick to notice when it was taken down, “relegated” ! It was certainly worthy of the occasion..well done MUM for making it happen. I regret my teenage recalcitrance, wish I could go back and change things. If I’m honest I still haven’t conquered that. Thanks for reminding me about those shoes Jon! and I think you’re right about the date – all of forty years ago. Great your friend had the foresight to start a self-portrait series right from her teenage years. And I’m glad you’re still recalcitrant! The two photos together are riveting. Why is that ? Ageing, generations…reminds me of the question, .if you change all of your cells over time, how can you be the same person? Reminds me also of the woman in Shoot Photography at the Photographers Gallery who took photos of herself every year since 1936, so you see her change over 60 years, but unlike with Martin’s family, you see the process in stages.